Did you know there is a WAGGGS ceremony? I didn't know this with my first troop, though they already had their pins and stuff when I "inherited" them. 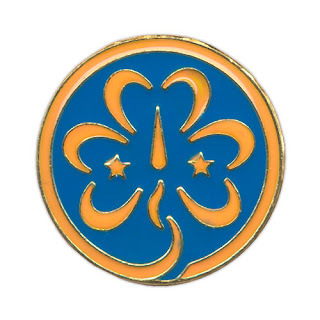 Anyway, my sweet little Daisy's are going to get their WAGGGS pin this month (February), because it's Thinking Day month. It ties in beautifully. Unfortunately, I have NO idea where I found this ceremony... if it's yours, please tell me and I'll update to give credit. Also, don't take offense, because I sort of tweaked it a little. So, I'm a terrible leader (no... I'm busy.) and totally forgot it was THIS meeting, so we will be building ours out of paper and piecing it together. IF I have time, I may make a felt one sometime to have for future ceremonies, because I think this would be nice to do each year with your troop for a reminder. I have 10 girls in this troop... so one girl was "in charge" of making sure we had a horseshoe shape the entire time. 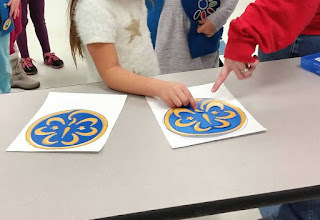 2 others led the GS Promise with the Trefoil shape we added, so we could count the 3 parts and another led it again at the end of the ceremony. It worked out pretty well. With girls this age, you can't leave anyone out or feelings are hurt. All participants stand in a horseshoe. Somewhere, have a table or felt board available for the construction of the pin as the ceremony proceeds. Leader: The horseshoe formation symbolizes the open friendship circle. In the open end of the horseshoe stand our sister Girl Scouts and Girl Guides around the world. If they were actually here, our horseshoe would become a completed circle, having no beginning or end. What is the world pin? It is the pin of the World Association of Girl Guides and Girl Scouts. We are going to construct such a pin. As we do, let us consider very carefully the reason for its color and design. Then we will know how deep a feeling of international friendship it can inspire in it. What does the gold circle around the edge stand for? The gold band surrounding our pin symbolizes the sun that shines on children all over the world. Why is the world pin blue? The blue background symbolizes the sky above us, all over the world. Why do we have a trefoil in the World pin? The gold trefoil is the sign of Girl Scouting and Girl Guiding around the world. The 3 parts of the trefoil stand for the 3 parts of the Promise. Let’s say the Girl Scout Promise together and count the three parts. There are 2 stars on the World pin. What does the left star stand for? The star on the left, the same side as our heart, stands for the pledge that all Girl Scouts and Girl Guides try, on their honor, to keep: the Promise. What does the other star stand for? The right star, on the side of a helping hand, stands for the Girl Guide and Girl Scout code of conduct--the GG/GS Law. What does the pointer in the middle stand for? We place a compass needle in the center, to serve as a guide pointing towards the right way in life. What does the base of the trefoil mean? At the base of the trefoil we place the flame. Its burning represents love for humanity and international friendship. Join me ending our ceremony by saying the Girl Scout Promise.